On November 6th, California voters will make their voices heard on Prop 37, the “Just Label It” initiative which would require the FDA to adopt new mandatory labeling of GMO’s (genetically modified organisms) in our food. Current polls indicate a whopping 92% of Americans are in favor of this legislative measure which will help consumers make informed choices about what’s in the food we buy and serve our families. Marin County emerged early on as a leader in this movement, passing Measure B in 2004 which prohibits cultivation of GMO crops, livestock, and “other organisms” within its boundaries. To date, Marin joins Mendocino and Trinity counties in California whose voters passed GMO crop ban measures to protect the integrity of agriculture, the environment, and consumer health. GMOs are created through a laboratory process of artificially inserting genes into the DNA of food crops or animals. These “enhanced” organisms and seeds are engineered with genes from bacteria, viruses, insects, and animals. Since their introduction into our food system 15 years ago, our government has spent over $17 billion dollars to subsidize many large-scale farm operations growing GMO crops. The vast majority of this funding goes to produce just four common food additives: corn syrup, high fructose corn syrup, corn starch, and soy oils. Corn and soybeans, two of the most commonly grown GMO crops, are primary ingredients in processed foods wide-spread throughout our food system. In fact, corn syrup is an ingredient so pervasive in our food supply that some manufacturers have started noting when it’s NOT included on their labels! As it stands now, GMO ingredients are found in as much as 80% of conventional packaged foods–and consumers don’t even know it. Also affected are ingredients made from bi-products of GMO sources: sweeteners like fructose, dextrose, glucose, and beet sugar as well as soy protein isolate, lecithin, isoflavone, vegetable oil and protein, canola oil, cottonseed oil, corn oil, corn starch, and gluten. In addition, GMO grain and alfalfa crops are the basis of commercial feeds used to fatten industrial feedlot animals raised for human consumption. Equally troubling is the common industry practice of injecting commercial dairy (rbST) and meat cattle with genetically modified growth hormones. Further down the food chain, consumers then indirectly ingest GMOs harbored in the meat and milk of these animals. It’s important to note on the brink of this election that the FDA is currently considering approval of the first GE animal intended for human consumption: an Atlantic salmon that contains the gene of an eel. So . . . with GMO’s so prevalent in our food supply, why aren’t they labeled? The players behind the push to keep consumers in the dark about GMO’s are “Big Food” companies like Monsanto, a U.S. based multinational agricultural biotechnology corporation that is the world’s leading producer of the herbicide “Roundup”. It is also the leading manufacturer of GMO seeds, responsible for 90% of those seeds sold in the United States, and investing millions in the development and patenting of them. This industry giant and its allies (Dow, DuPont, and others) have vigorously fought the labeling of GMO food for decades, successfully persuading the FDA that the new crops are “substantially equivalent” to non-modified crops and as such, do not require regulation or labeling. Yet despite this position, Monsanto describes its GMOs as a “new agricultural paradigm” worthy of patent protection, which has also given the company unprecedented control over testing and independent research regarding its product. Monsanto, and other chemical giants like Dow and DuPont, have spent more than $25 million dollars to date opposing Prop 37. Consumers have to wonder what they’re hiding, given their claim that GMO’s are not substantially different and, according to short-term studies conducted by their own researchers, pose no recorded health risk to consumers. Also on the “No to 37” bandwagon are the Grocery Manufacturers Association as well as some of America’s biggest food and beverage makers including PepsiCo, Nestle, Coca-Cola, and General Mills–concerned that consumers will shun their products once ingredient transparency is mandated. Not surprisingly, with so much to lose at stake, these companies and others have launched an all-scale war against Prop 37 with rhetoric designed to confuse and scare consumers. The multi-million dollar barrage of prime time television spots in the past week, at the very least, have consumers scratching their heads about 37. Opponents of the measure are hoping that by tap dancing fast, consumers will be confused enough by their razzle-dazzle and threatening forecasts of increased grocery bills to vote no. Don’t be confused. If you freeze your television long enough to read the long list of ad sponsors that flashes on the screen for a nano-second at the end of each spot, you’ll see “major funding provided by Monsanto, DuPont, Dow, Cargill, General Mills . . .” and the list goes on–all companies that have produced, grow, or contain GMO’s in their food. Coincidence? Meanwhile, the effects of GMO crops on the environment and consumers are potentially devastating. Formulated specifically to be resistant to herbicides like Monsanto’s Roundup, these engineered plants are subject to repeated spraying of more herbicide to manage weed control without risk of damage to the crop. In fact, the U.S. Department of Agriculture estimates more than 100 million pounds of additional herbicide have been used on U.S. farms since the introduction of GMO crops. This practice has resulted in Roundup resistant strains of “super weeds” requiring farmers to use more and more toxic chemicals for control. Evidence is mounting that the heavy spraying of these GMO crops is causing pesticide contamination of ground water and soil, as well as posing increased health risks to farm workers, wildlife, and consumers. Alarmingly, consumer health effects of long-term consumption of GMO foods is unknown. Licensing agreements held by the chemical and biotech companies that manufacture and tightly control the patents on genetically engineered products have restricted research into the health impacts of their products. Those same licensing agreements expressly forbid research unless approved by the patent-holders, which effectively allows the manufacturers of these organisms to police themselves. It’s a lot like asking the fox to guard the henhouse. Perhaps more concerning are the recent timely results of the first long-term study on health effects associated with GE foods from University of Caen molecular biologist Gilles-Eric Seralini. Published in the Journal of Food and Chemical Toxicology, the two-year study details an experiment involving rats that were fed a diet of varying percentages of Monsanto’s Roundup resistant corn, or were given water containing the herbicide at levels found to be acceptable by United States standards in tap water, or in GE feed. It is important to note that this study is significant because it tracked the rats throughout their entire lifespan of two years, a more realistic measure of long-term GMO exposure than the biotech industry’s three-month study period, which only follows rats into early adulthood. The negative health effects documented in Seralini’s study would only be discovered over a longer period of time. The results were startling. Researchers found that the rats fed GE corn and given water with “acceptable” levels of herbicide developed 2 to 3 times more large tumors than the control group. Female rats developed mammary and pituitary gland tumors and suffered hormone disruption, while their male counterparts experienced serious kidney and liver damage in addition to developing tumors. 50% of the males and 70% of the females died prematurely, compared to 30% and 20% respectively in the control groups. By the beginning of the second year of the study, 50-80% of female rats in all treated groups had developed large tumors versus only 30% of the control group. The research also showed that the rats did not have to be exposed to high doses of Roundup to experience significant ill effects to their health. The results, in fact, demonstrated that lower levels of herbicide formulations at concentrations well below officially set safety limits induced severe hormone-dependent mammary, hepatic, and kidney disturbances. To date, the FDA has not required any independent testing to verify the safety or potential health effects of these genetically modified products in our food supply, despite the fact that more than 50 countries have already banned or require labeling of GMO’s–including many in the European Union, Japan, and New Zealand. At the very least, these facts should give consumers pause. What can you do to help protect yourself and your family? Insist on your right to make informed choices by requiring the FDA to label GMO ingredients in our food. Say YES to Proposition 37. *you are in favor of gaining access to information that allows you to make informed choices about the food you buy and consume. *you support sustainable farm practices that place value on the continued health of soil, water, and environmental health, as well as the humane treatment of animals raised for consumption. *you are a savvy consumer who is concerned about the presence of industrial chemicals, pesticides, and growth hormone residues present in the large-scale commercially farmed food we purchase and eat. Buy organic whenever possible. Products labeled “100% organic”, “organic”, or “made with organic ingredients” do not allow ingredients made with GMO’s. Some companies may voluntarily label products as “non-GMO”. Ideally, eat whole, unadulterated foods and avoid processed “convenience” foods. Avoid meat and milk from commercially raised livestock likely fed with GMO alfalfa, corn, and soybeans. Always choose organic animal products from free-range, grass-fed livestock, or buy from local farmers who verify they do not give their animals GMO feed or injections. There are eight GMO foods available in the United States: corn, soybeans, canola, cottonseed, sugar beets, Hawaiian papaya (about 50% are GM), and small amounts of zucchini, yellow crookneck squash, and sweet corn. Always choose organic versions of these foods. Download a copy of the True Food Shopper’s Guide from the Center For Food Safety as a handy reference–also available as a free app for iPhone and Android. Prop. 37 isn’t a perfect solution. It’s not a “be all-end all panacea”, nor was it meant to be–but it IS a step in the right direction. Critics point out that the measure’s text exempts labeling of animal products from animals fed diets containing GMO’s or injected with GM drugs. Also, all restaurant food and food bars, as well as other food “intended for immediate human consumption” would be exempt from labeling requirements as the initiative is currently written. As is always the case, let the consumer beware. We cannot afford to be complacent bi-standers with regard to our food, and we cannot put blind trust in government agencies or industrial food companies to watch out for our best interests. The eyes of the country are on us California. Will we lead the charge for consumer’s right to know, or maintain the status quo and allow ourselves to remain blissfully ignorant about what’s in the food we eat? Join me in voting YES for Proposition 37! Freewheelin’ Food: Chef Matt Elias & The Bodega, CA. Thank you so much for your kind words Frank. I also enjoyed your post in favor of Proposition 37! If we all join together in voicing our concerns about GMO’s and their potential effects on public health and our food shed, we can promote positive change. 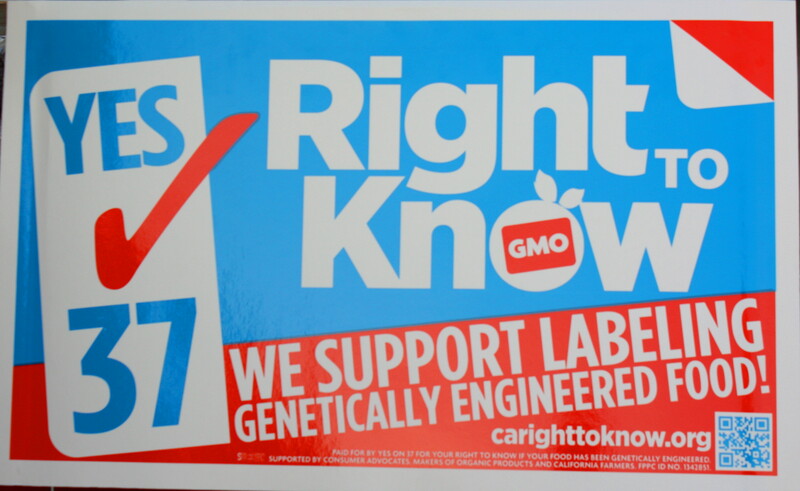 That starts with labeling foods containing GMO ingredients so consumers can make informed choices. Unfortunately, Prop. 37 is up against a very vocal and misleading opposition (industrial companies like Monsanto, Dow, DuPont, PepsiCo, General Mills and others) with a vested interest in seeing it defeated. I truly hope Californian’s will rise to the occasion presented by Prop. 37 and send a message for labeling transparency that will be followed by other states. The nation will be watching us on November 6th. Europe implemented GMO-labeling, to the cries of opponents who claimed grocery bills would rise. In the end, there was no financial impact from GMO-labeling. Monsanto is rolling out its cadre of female scientists to make us think there are no health risks to GMOs. But this mom says, “I have the right to know!” Especially as I move to a gluten-free diet, I have serious concerns when I buy corn chips or corn tortillas that are not organic. Thanks, Karen, for tackling this controversial topic. Thank YOU for your insightful comments Nancy. The ad campaigns that are currently running, funded by Monsanto and others, are designed specifically to deceive, confuse, and scare consumers into voting NO. There’s no better arsenal than educating ourselves on the factual evidense around this issue. I believe if people take the time, and look beyond “Big Food’s” rhetoric–they will be empowered to say YES to Prop. 37 and the right to know what’s in our food. Thank you Karen for always getting the much needed info out there. You are a blessing! Thank you Karen for always getting the much needed info out there! You are a blessing! Thanks for taking the time to read and educate yourself on the facts around this issue Loree! The multi-million dollar negative ad campaigns, sponsored by those support the GMO industry, that are currently running on TV are causing many to question the integrity of this measure. Please pass the link to my article forward to everyone you know and let’s keep the YES momentum moving forward! Well done, Karen! The confusing ads are really getting to me, and it’s nice to read a no-nonsense explanation of the facts! My pleasure Susan. As I point out at the end of my article, Prop 37 isn’t a perfect solution–but it is a much needed starting point, and would still provide consumer protections where NONE currently exist. Education and awareness are powerful tools. At the very least, the conversations swirling around this measure will hopefully make consumers sit up and take more notice of what’s in the food they buy. Thank you for reading and please, pass the article forward!